Namaqua House is an art deco building on the corner with Short Market Street, towering over the buzzing Green Market Square in Cape Town City Bowl. It has been reported that the building was originally built in 1929, to a design by architects Roberts & Small. The 8-storey building presents a cantilevered balcony on both the two sides of the corner building. Site seen from street level. For this project, the scope of work consisted of extensions to accommodate two additional floors, namely the 9th and 10th. The Consulting Engineer Studio appointed is renowned De Villiers & Hulme Consulting Engineers, and we're proud to have been appointed as the structure supplier. Both floors will make use of the slab and stair systems, designed by Element Engineers for Cobute. 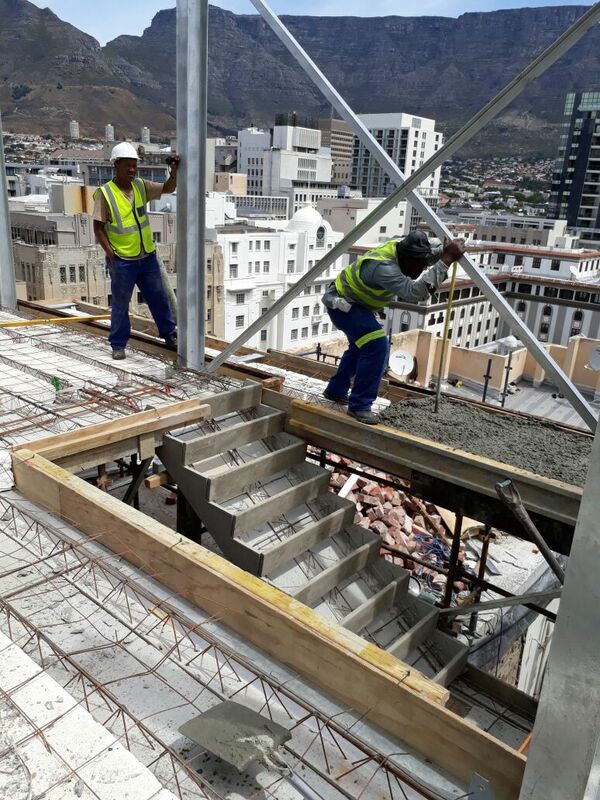 Being an existing building, the Engineers opted for the Cobute decking at its lightest, consisting of precast ribs and polystyrene blocks for a weight of 37kg/sqm. The structure on the 9th floor is supported by steel beams on existing concrete beams and columns, while on the 10th floor the steel structure is supported by steel beams and columns. The structure will also make use of Modulo by Geoplast as a light filler element to levels the different height in the kitchen. 10th floor casting at Namaqua House. Contact us for more information on this project or to get a free proposal on the Cobute precast for your project!